Seán Ducque is charged with murdering Kieran Farrelly in Dublin city in 2014. 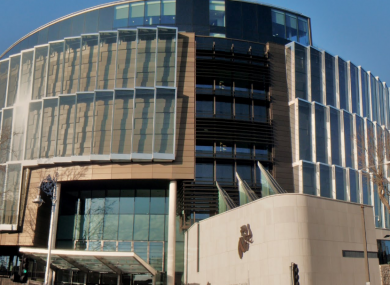 THE TRIAL OF a 33-year-old man, accused of murder with a shotgun, has heard that he tried to urinate on his hands before gardaí tested them for firearms residue. Garda Aaron Hoey was giving evidence to the Central Criminal Court on Friday morning in the trial of Seán Ducque, who is charged with murdering Kieran Farrelly in Dublin city. The father of one, of no fixed abode, has pleaded not guilty to murdering the 33-year-old on 26 October 2014 at Killarney Court, Killarney Street. However, he has admitted through his barrister that he ‘fired two shots from a shotgun, later found on Mabbot Lane, which killed Kieran Farrelly’. Garda Hoey told Dominic McGinn SC, prosecuting, that authorisation was given to take forensic samples from the accused during his detention the following day. “I believe there were bags placed on his hands,” he said, explaining that this was to preserve any firearms residue, which can be removed by friction, including hand washing. “I was informed that Seán Ducque had tried to urinate on his hands, remove the bags and remove the residue from his hands,” he testified. He said he decided that the quicker the samples could be taken, the better. However, he managed to obtain the samples. The garda agreed with Hugh O’Keeffe SC that this was during a period of time when his client had been deemed medically unfit for interview. He also agreed that the accused was cooperative when he took other samples from him a number of hours later. Forensic scientist Dr John O’Shaughnessy examined the jacket Seán Ducque was wearing when arrested that morning. “I found firearms residue,” he testified. He said it was similar to the residue from the discharged shotgun cartridge found at the scene. “The jacket provides strong support for the view that Seán Ducque discharged the shotgun in this instance,” he said. Garda Catherine McAteer played the jury CCTV footage taken from the area that night. It showed four people walking together at 11.30pm. She said she believed these to be the accused, the deceased and the women who the jury heard were their partners. The same garda camera captured three of these people walking in the opposite direction 10 minutes later. The deceased was no longer with them. John Berry BL, defending, then stood up and said it was admitted that the accused had possession of the shotgun, later found on Mabbot Lane, in a Skoda on Terrace Place at 7 o’clock that evening. The prosecution has now closed its case and the trial will continue tomorrow before Justice Paul Butler and a jury of six men and six women. Email “Accused tried to urinate on his hands before firearms residue testing, court hears”. Feedback on “Accused tried to urinate on his hands before firearms residue testing, court hears”.